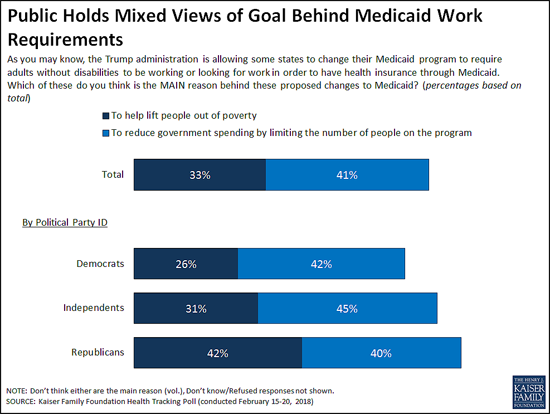 At a time when the Trump Administration is encouraging state efforts to revamp their Medicaid programs through waivers, the latest Kaiser Family Foundation tracking poll finds the public splits on whether the reason behind proposals to impose work requirements on some low-income Medicaid beneficiaries is to lift people out of poverty or to reduce spending. When asked the goal of work requirements, four in 10 (41%) say it is to reduce government spending by limiting the people enrolled in the program, while a third (33%) say it is to lift people out of poverty as proponents say. While larger shares of Democrats and independents say the reason is to cut costs, Republicans are more divided, with roughly equal shares saying it is to lift people out of poverty (42%) as to reduce government spending (40%). People living in the 10 states that have approved or pending work requirement waivers are similarly divided, with near-equal shares saying the goal is to lift people out of poverty (37%) as to reduce government spending (36%). This holds true even when controlling for other demographic variables including party identification and income. In addition to work requirements, five states are currently seeking Medicaid waivers to impose lifetime limits on the benefits that non-disabled adults could receive under the Medicaid program. The poll finds the public skeptical of such a shift, with two thirds (66%) saying Medicaid should be available to low-income people as long as they qualify, twice the share (33%) as say it should only provide temporary help for a limited time. Substantial majorities of Democrats (84%) and independents (64%) say Medicaid should be available without lifetime limits, while Republicans are divided with similar shares favoring time limits (51%) and opposing them (47%). These views may reflect people’s personal experiences with Medicaid and the generally positive views the public has toward the current program, which provides health coverage and long-term care to tens of millions of low-income adults and children nationally. Seven in 10 Americans report a personal connection to Medicaid at some point in their lives – either directly through their own health insurance coverage (32%) or their child being covered (9%), or indirectly through a friend or other family member (29%). Three in four (74%) hold favorable views of Medicaid, including significant majorities of Democrats (83%), independents (74%) and Republicans (65%). About half (52%) of the public say the current Medicaid program is working well for low-income enrollees, while about a third (32%) say it is not working well. Under the Affordable Care Act, most states expanded their Medicaid programs to cover more low-income adults. In the 18 states that have not done so, a majority (56%) say that their state should expand Medicaid to cover more low-income adults, while nearly four in 10 (37%) say their state should keep Medicaid as it is today. Slightly more than half of Republicans living in the 18 non-expansion states (all of which have either Republican governors, Republican-controlled legislatures or both) say their state should keep Medicaid as it is today (54%) while four in 10 (39%) say their state should expand their Medicaid program. The poll finds 54 percent of the public now holds a favorable view of the Affordable Care Act, the highest share recorded in more than 80 KFF polls since the law’s enactment in 2010. This reflects a slight increase in favorable views since January (50%), while unfavorable views held steady at 42 percent. 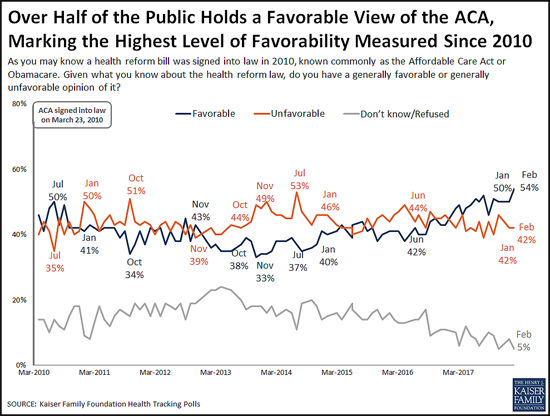 The shift toward more positive views comes primarily from independents (55% view the ACA favorably this month, up slightly from 48% in January). The poll also probes the public’s awareness about the repeal of the ACA’s requirement that nearly all Americans have health insurance or pay a fine, commonly known as the individual mandate. The tax legislation enacted in December 2017 eliminated this requirement beginning in 2019. About four in 10 people (41%) are aware that Congress repealed the individual mandate, a slight increase from January, when 36 percent were aware of the provision’s repeal. However, misunderstandings persist. Most (61%) of the public is either unaware that the requirement has been repealed (40%) or is aware of its repeal but mistakenly believes the requirement will not be in effect during 2018 (21%). Few (13%) are both aware that it has been repealed and that it remains in effect for this year. Looking ahead to this year’s midterm elections, the poll finds Democratic, Republican and independent voters most often cite costs as the health care issue that they most want candidates to address. When asked to say in their own words what health care issue that they most want candidates to discuss, more than twice as many voters mention health care costs (22%) as any other issue, including repealing or opposing the Affordable Care Act (7%). Costs are the clear top issue for Democrats (16%) and independents (25%), and one of the top issues for Republicans (22%) followed by repealing or opposing the ACA (17%). Designed and analyzed by public opinion researchers at the Kaiser Family Foundation, the poll was conducted from February 15-20, 2018 among a nationally representative random digit dial telephone sample of 1,193 adults. Interviews were conducted in English and Spanish by landline (422) and cell phone (771). The margin of sampling error is plus or minus 3 percentage points for the full sample. For results based on subgroups, the margin of sampling error may be higher.